Capri Island is located on the south side of the Gulf of Naples, Italy. It is in the Tyrrhenian Sea. It is a very popular destination for casual tourists and experienced travelers. The very first people to settle on this island were the ancient Greek Teleboi. Some remains have been found by excavation teams. The highest point of Capri is Monte Solaro at 1,932 feet. The largest attraction of the island is the Blue Grotto. It was previously used as a personal swimming hole for Emperor Tiberius. The island is divided into two sections. The eastern section is known as Capri and the western part is called Anacapri. In the past Anacapri could only be reached from the sea by a flight of 800 steps called the Scala Fenicia. This section is much more spread out and residential and it is where you can take the chair lift to the top of Monte Solara. Capri Island has hot summer and cool winters. Its average summer temperature ranges between 27 to 31°C and winter temperature between 10 to 15°C. The island has two harbors which are Marina Piccola and Marina Grande. The Caprese salad got its name from the island. It translates ‘the salad of Capri’. This salad is made with tomato, fresh mozzarella and basil with seasoning of salt and olive oil. Capri Island’s most iconic square is Piazza Umberto I, which is best known as ‘La piazzetta’. This island is a single block of limestone with a total area of around four square miles. Declan, Tobin. " 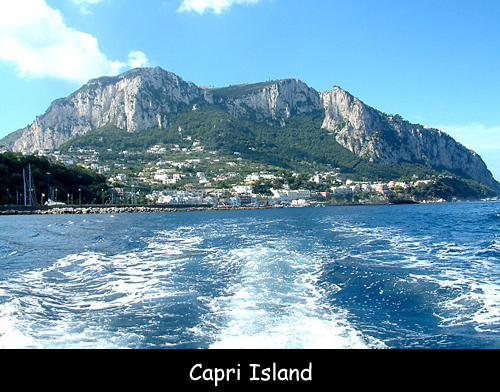 Fun Facts about Capri Island ." Easy Science for Kids, Apr 2019. Web. 26 Apr 2019. < https://easyscienceforkids.com/capri-island/ >.